Dr. Jim and Sydney Boerner love Christmas and their home at 2239 Shannon Drive in Murfreesboro proves it. 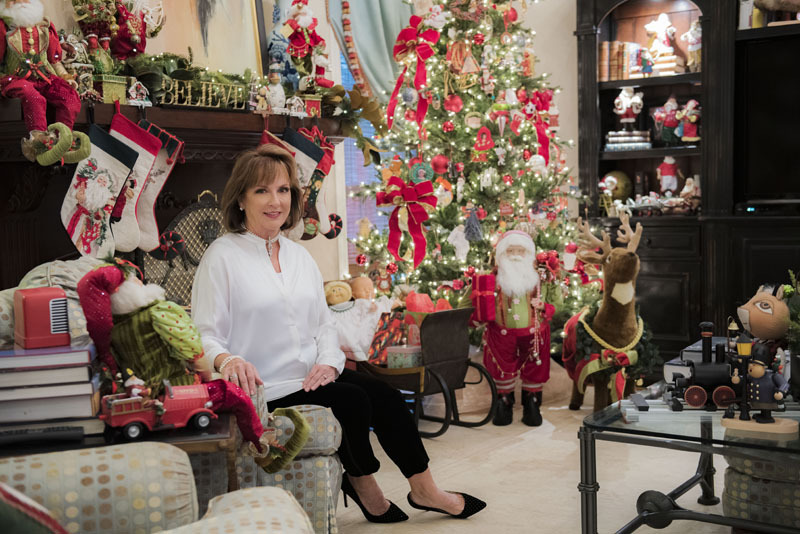 Nestled in the back of the older Riverbend subdivision, their home is cozy, elegant and filled with love year-round, but it really comes to life for the holiday season. As Sydney graciously gave a tour of her home she gave handy tips and tricks about decorating for the holidays and staying organized while doing so. It takes her about a full week of intense labor getting their home perfected each year. The Boerners married nine years ago and purchased their home on five acreson Shannon Drive and have loved the charming subdivision ever since. Trees provide ample shade outside, and behind the house runs a stream that takes anyone relaxing on the back patio out of the city. Interestingly, when the Boerners first began their home search nearly a decade ago they looked at the Shannon Drive house and then moved on in their search. It simply needed too much work to give them what they needed in a home. Fast forward about six months, they still hadn’t found a home and decided to give the Shannon Drive house a second look. They began remodeling the house as soon as they moved in, and the process continues today. They remodeled all the bathrooms, the kitchen, replaced all the windows, added hardwood and molding. “We decided the best way for us to proceed was slowly,” she said. “We did not have a vision of the entire project when we began nine years ago.” Over time, other renovations included the addition of a new columned front porch. Behind the house, a separate building was converted into an entertainment room complete with kitchen facilities. This is where the grandchildren eat, play and enjoy time away from the adults on Thanksgiving and Christmas. “When we host events, the caterers and bartenders can set up back here and they love it,” she said. Of course, this room, a secondary kitchen and dining room, is decorated as beautifully as the rest of the home. Other big projects over the years included the addition of a large outdoor fireplace in the back that features stone paths and walks, knotted boxwood gardens and many plants indigenous to this area. The Boerner home feels warm and full of holiday spirit, largely in part due to the efforts of Sydney. She’s always loved Christmas and also loves caring for others and making her family feel at home on the holidays. Their large Christmas tree is filled with ornaments that the children made when they were growing up, and ornaments collected during their travels over many years. Sydney is also a collector of Byers carolers and Possible Dreams Santas and has been for many years. She used to purchase one each year when she’d visit the Peddler to see their Christmas decorations. “A couple of years ago I began collecting handmade wooden German smokers that will someday be passed down to the grandchildren like the carolers and Santas,” she said. Though Sydney does much of the work herself — again, it takes a week of intense labor on her part — she also appreciates some help from others each year. Sheila Hines decorates their outdoor mantel each year and their wonderful friends at the Peddler have also helped guide and direct all of the redecorating, design and furnishing of the house over the years. “I have learned a few things along the way,” said Sydney, regarding the process of decorating for the holidays. “The first thing is to be very organized. Much less storage room is required when this is done.” Sydney uses see through storage bins that are stacked on shelving in her garage. She says hot attics will ruin Christmas décor so the garage is a much safer place to store your items. Sydney has also been known to decorate a small bathroom tree each year with empty perfume bottles and strands of imitation pearls. Another fun decorating tip: Kids love decorating oranges with whole cloves. No matter what you decide, be creative, have fun and cherish the memories. Dr. Jim Boerner is an obstetrician and delivers many babies in Murfreesboro each year, probably 10,000 in the past 35 years, he estimates. He is currently president of the St. Thomas Rutherford Foundation Board and serves on various other boards in the community. Jim enjoys his Rotary group, flying airplanes, spending time at Stones River, which backs up to their property, and making S’mores with their nine grandchildren. Sydney is also a very busy person, but especially delights in being a grandmother. She is retired now and when she’s not with family she’s actively volunteering somewhere in Murfreesboro. She is a past president of Charity Circle, a member of the Optimistic Garden Club, and a St. Thomas volunteer. “I love homemaking, cooking, gardening and most importantly being an adoring grandmother to my nine grandchildren,” she said. The Boerners are members of First United Methodist Church.